We can’t say for sure which fish ate the al-Qaeda leader, but chances are it was one of these courageous ocean dwellers. While there’s no empirical evidence that this massive tuna fish swallowed the deceased bin Laden, it certainly has the size (and appetite!) to do so. 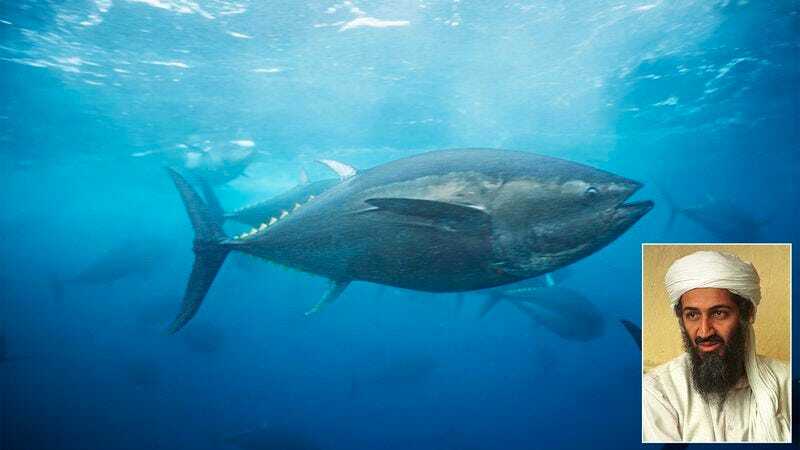 If, indeed, this tuna ate the man who perpetrated 9/11, then we as Americans salute it. The Arabian Sea, where bin Laden’s corpse was laid to rest, has a mean depth of 8,970 feet, meaning there’s a good chance the dead terrorist plummeted deeper than most fish can swim. But lurking far below the water’s surface, this giant isopod could’ve easily devoured the linen-wrapped carcass at a tremendous depth, and it probably would’ve been eager to do so, since you can’t imagine too much food drifts down there. You might be thinking that dolphins are nice fish that wouldn’t dare eat a human, but MRI scans have long shown that they’re second only to humans in intelligence, and if this dolphin knew of bin Laden’s heinous crimes when it ran across his dead body, it would’ve likely known it had a duty to ravage his flesh with its razor-sharp teeth. It doesn’t matter if it ate bin Laden’s entire body in one single morsel or just took a few bites of a leg—this wahoo would command all of our recognition and respect. This fish may look small, but he can inflate, balloon-like, on a dime, becoming exponentially larger. He could’ve probably stuffed all 6 feet, 4 inches of bin Laden’s frame into his elastic stomach, afterwards dragging his man-filled belly laboriously along the sea floor until the meal could properly digest. And if he succeeded in ingesting America’s Public Enemy No. 1, then he is a hero of the highest order. This isn’t technically a fish, but c’mon—whales are fish. And this whale probably swallowed Osama bin Laden. The largemouth bass is by far the most American fish there is, and this guy undoubtedly would’ve felt some patriotic duty to consume Osama bin Laden. And since its mouth is large, it probably could’ve managed to swallow the heinous villain if it really tried. Granted, this is a freshwater fish that lives in America, but if there’s a will, there’s a way, and this fish would’ve done everything in its power to make it happen. If it did actually eat Osama bin Laden, then it deserves the Presidential Medal of Freedom.